Home // Vault // RAW HM100X LRT in .25 cal. A High-End American-Made Laser Beam! 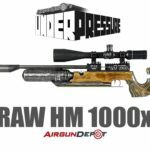 RAW HM100X LRT in .25 cal. A High-End American-Made Laser Beam!